Few other design firms have the adaptability and flexibility of Hunter & Company, especially when they take on a kitchen design. Founder Hunter Dominick has proven as much, as her team has created kitchens from the chic to the shabby, progressive to traditional. Every project makes art of the kitchen, and celebrates the lifestyle and character of each individual client, however different their tastes may be. Starting with the traditional, Dominick takes dimension and functionality into account while designing something to fit the needs of her client. The “Culinary Creations” kitchen exemplifies her ability to create a traditional look while melding the space with a sense of freedom and outdoors. “We were creating a fun, usable gathering space for this family,” says Dominick. The remodel has two large working and gathering areas, an island, and a peninsula with granite countertops. Dominick and her team refer to the space as a “culinary delight” because of its light and airy feel melded with traditional and functional design. 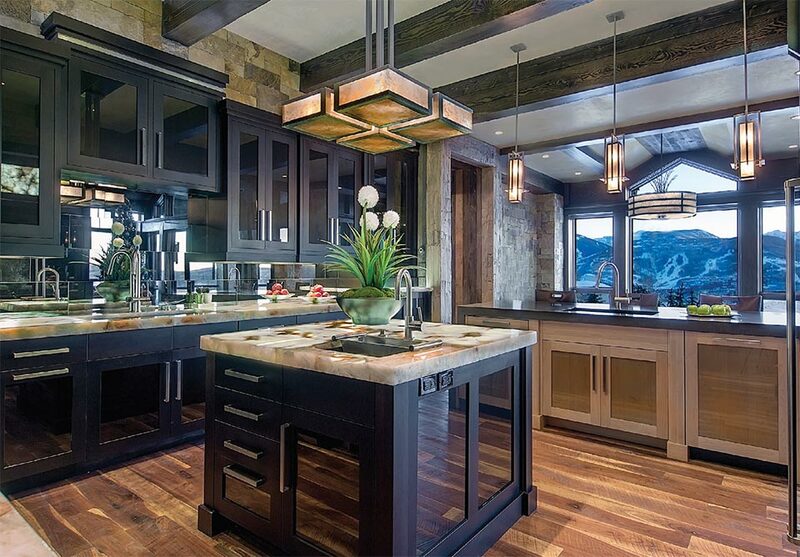 Cooking in this kitchen would be quite delightful. “The French doors open up to the side of a mountain, which makes for a great interior/exterior connection from the kitchen,” says Dominick. “While the icy green backsplash modernizes the space, the connection to the outdoors grounds it. It was obvious for us to connect the space to the large outdoor entertaining space, which has a fire pit and view of the entire Flathead Valley and Flathead Lake, to create a feeling that is both peaceful and calming.” Add seven custom-made barstools with Sunbrella fabric, a wet bar, and two different prep areas and the space becomes just as welcoming to guests as it is to hosts. Dominick and her team aim to meet the same goals of usability and beauty in varying stylistic tastes. 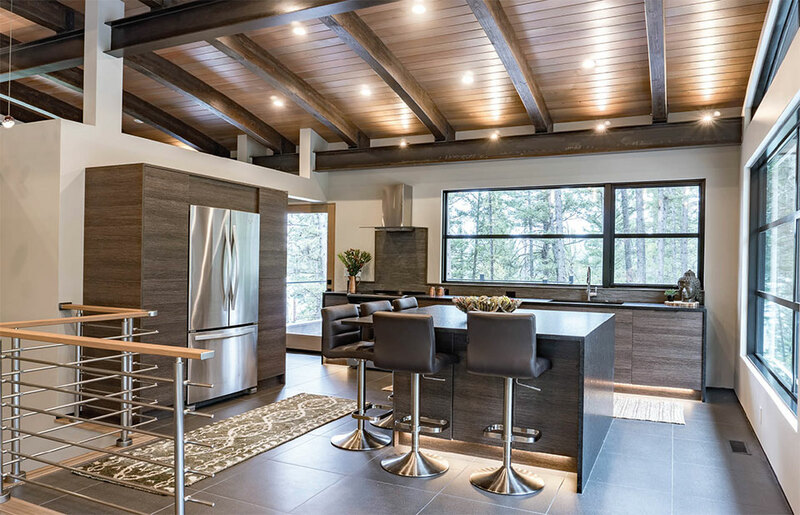 Take a more modern example, which the team has named the “Modern Ski-Out Treehouse.” This kitchen incorporates clean lines, pops of color, sleek cabinetry, and open shelving to create a space that is as satisfying to look at as it is to use. This space is all about cohesion. At first glance, a guest might not even notice that the fridge is completely camouflaged, or that a wet bar sits behind the cooking area. The aqua glass mirror paint draws the eye and evokes a sense of calm and organization that is maintained throughout the entire home. Accenting rather than covering the log walls, Dominick and her team left the space open. They selected antiques from local shops and mixed fabrics and textures to create a welcoming, homey feel to the room. They used a bar-top style for the countertops and embraced appliances rather than hiding them. 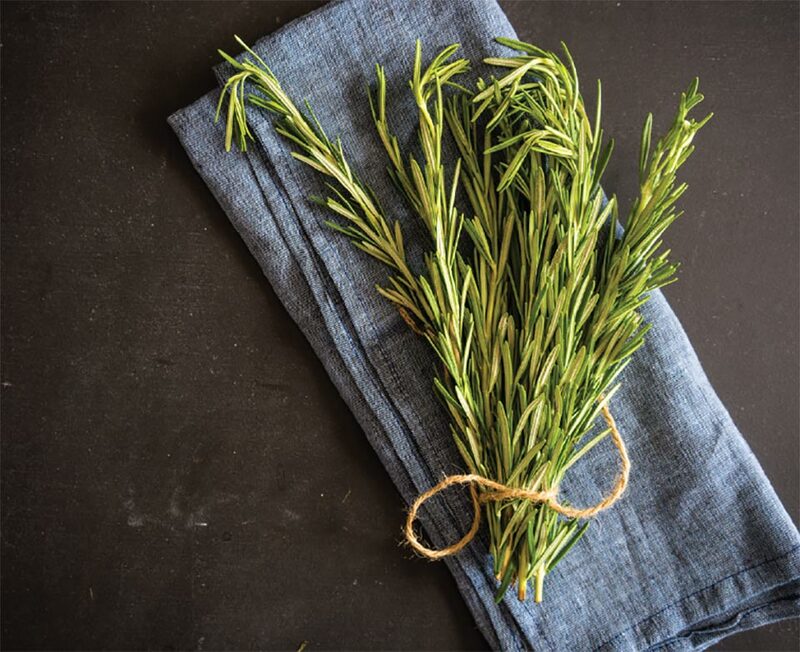 “With creativity and resourcefulness, a lot can be done on a small budget,” asserts Dominick. 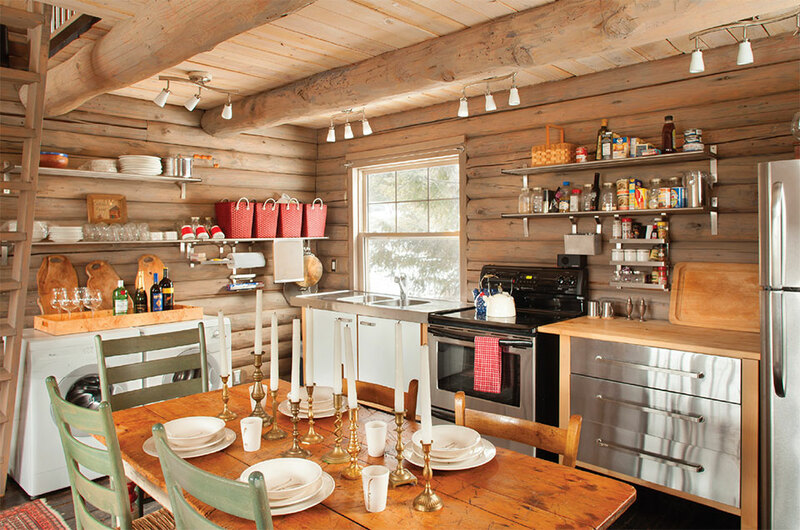 With cabinetry from Ikea and a jaw-dropping final product, this cabin proves that point. “Succulents thrive on neglect,” says Lamberson. Once you’ve put them in a sunny spot and soaked them with water, let them sit for weeks on end. With those two requirements fulfilled, they’re the ultimate low-maintenance plant. Luxury projects brought Andy Fischer and Brad Reedstrom to the Mountain West, but it was the mountains themselves that made them stay. Decades ago, they traveled to Jackson Hole from Minnesota to work on a custom build, work that would eventually lead them to Northwest Montana where they co-own Bigfork Builders. 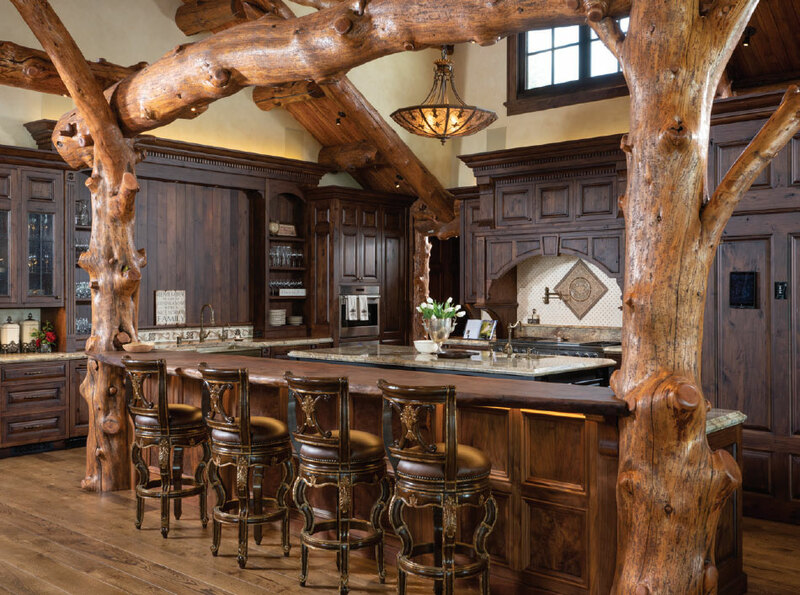 For the past 25 years, Bigfork Builders has been known for melding “Old World” craftsmanship with lasting Montana character. In a world that grows increasingly more digital and less personal, it’s no surprise that Bigfork Builders prefers hands-on interaction and connection in their projects. The same holds true for kitchen builds, which require the most interaction to truly get right. 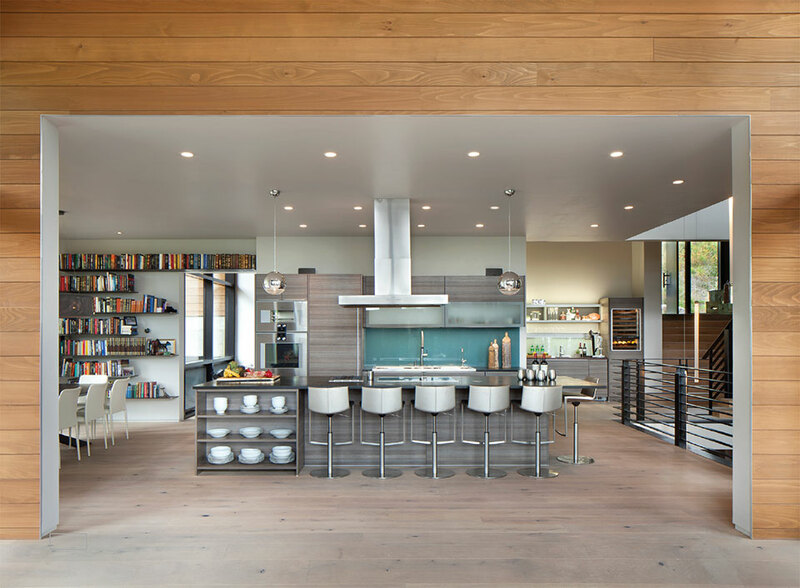 “We find it is extremely helpful to have multiple conversations with the homeowner about their goals for the kitchen before working with the architect and the designer to make it all come together,” says Reedstrom. The goal of those conversations is to weed out the practical use of the space for each client in order to decide on a kitchen floor plan, electric requirements, appliance placement, and product selection. 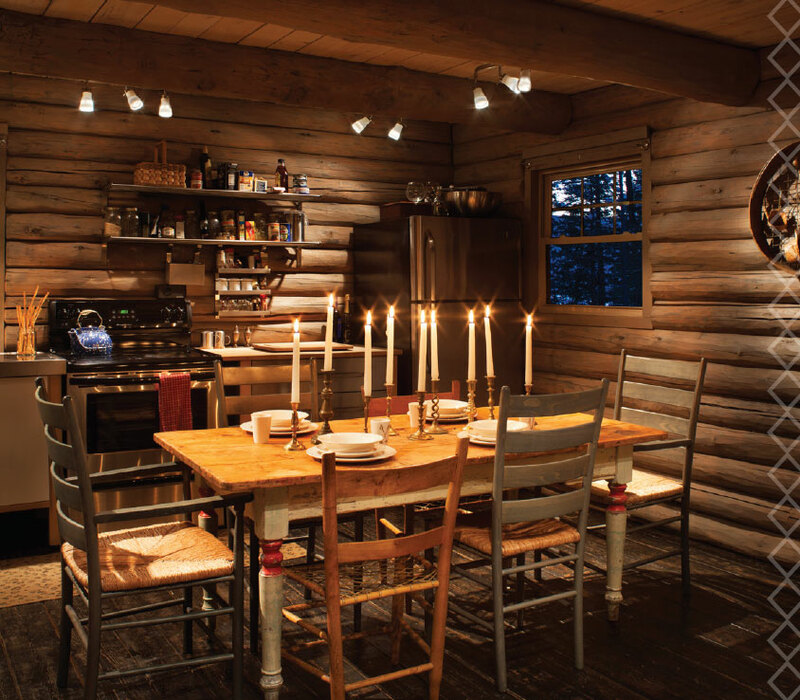 The Bigfork Builders team encourages every person who is planning a kitchen to start the process early. Because we spend so much time in the space, as clients, it’s worth devoting hours of planning to get exactly what we want. And then comes the fun part: product selection. Products include appliances, lighting, or countertops. This is where designers enter the picture, connecting with builders to ensure that selected pieces will physically (and aesthetically) fit into the space. Always noting trends, and being the actual hands that create them, the Bigfork Builders team has noticed a growth in several different mountain aesthetics. 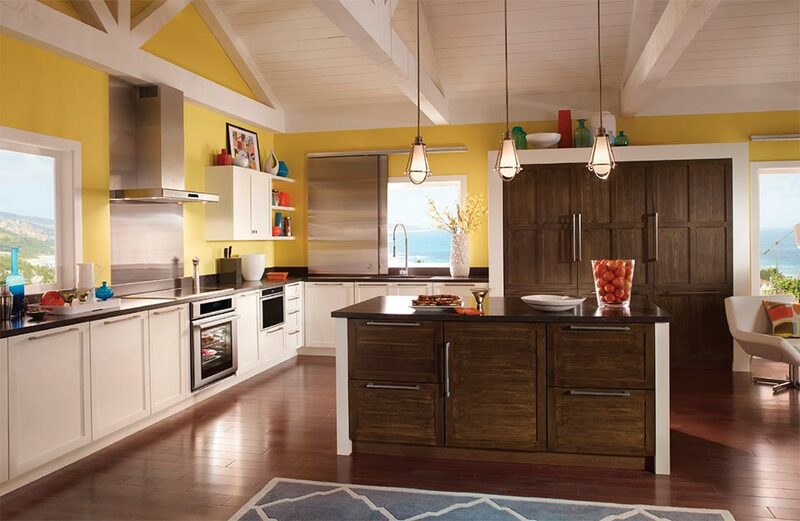 Additionally, bold colors are having a moment, even on those cabinetry surfaces, which are often two-toned. Another thing that’s coming in pairs? Islands. 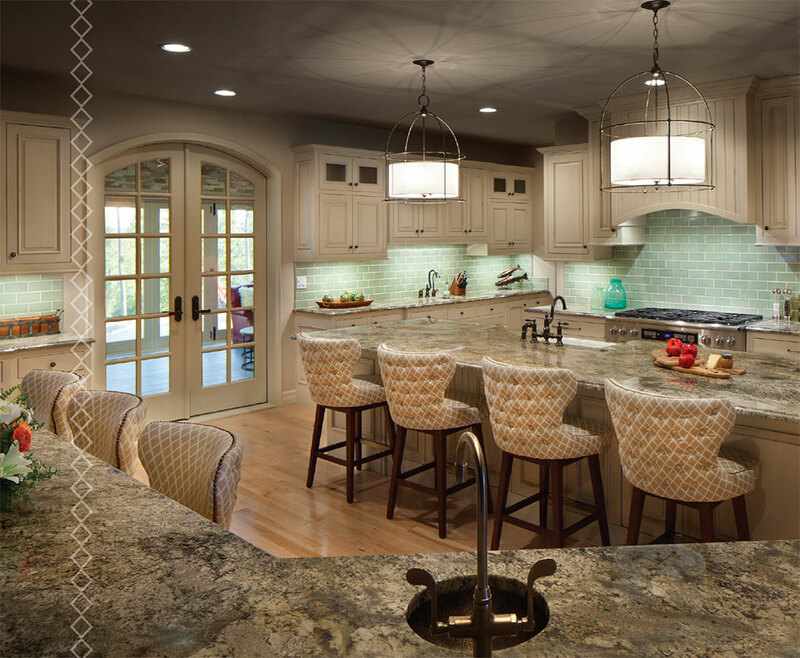 “We find that homeowners are adding two islands to their kitchens. They want both a gathering space for guests as well as a large work area.” Tech-y, touch-activated plumbing fixtures provide the added bonus of keeping those work areas clear of greasy fingerprints. Not all builders are willing to meet regularly with their clients to adjust, refine, and redesign, while making several digital and physical mock-ups along the way. It’s that kind of dedication that makes a difference in the final product. If you’re going to put that much time into your kitchen, why shouldn’t your builder? Such is the mindset of Bigfork Builders, whose final products prove their point. The motto of Jennifer Zetooney and Shaina Hanson’s interior design studio is to create harmony and beauty that lifts people up. Just because the kitchen is a functional space does not mean that it can’t be beautiful. On the contrary, a kitchen must arc between aesthetic and usability in a seamless fashion, and it’s Zetooney and Hanson’s job to oversee the flow between function and form. It starts with framing the space so that energy flows from Montana’s striking landscape directly into a home. “For our latest kitchen projects, the design of the space revolved around the view,” says Hanson. That means orienting counter space to face the mountains, considering window design, cabinet height, and lighting to make spaces feel as natural and connected to the outside as possible. Open space concepts have totally different looks than kitchens past, where entire rooms were cluttered with cabinetry and storage spaces. That point brings us to the duo’s second iteration of flow: that between the kitchen and the rest of the house. 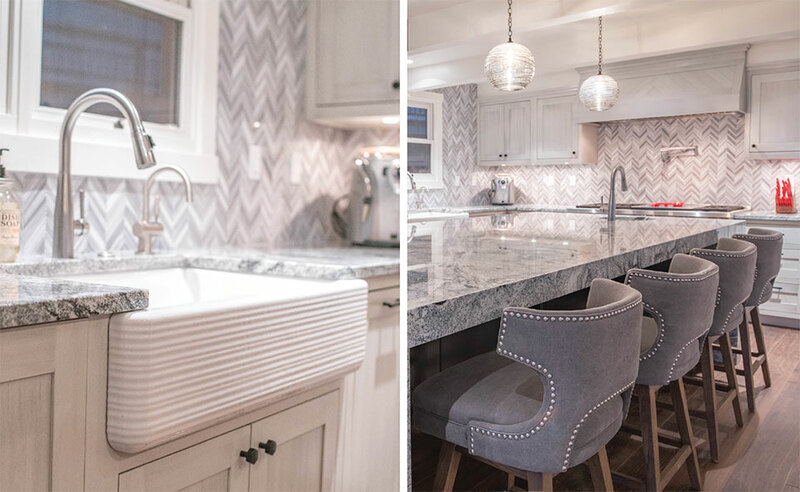 When designing the kitchen, particularly in open floor plan homes, Zetooney and Hanson take care to coordinate the small details of different rooms. Small details such as the material or color of the stove hood, or stone in the backsplash, get reflected in the tones and textures in the great room of the home. “We have drifted away from everything needing to match,” says Hanson. “Elements like lighting or hardware can be a little bit different between rooms as long as some of the finishes or textures are similar.” That’s where the designers shine, because choosing between textures and finishes for one room (let alone an entire home) awakens the paradox of choice for clients. Zetooney and Hanson work directly with clients to narrow down those choices by means of functional decision-making. The clients’ characteristics are reflected in selections such as color, materials, and orientation of the kitchen. A major part of creating harmony with design is not only in selecting the right pieces for clients, but also in creating flow between the different voices in a project. “It’s a balancing act,” affirms Zetooney as she describes the communication that happens between designers, builders, architects, cabinet installers, fabricators, and clients. “We become our client’s spokesperson. They confide in us about what they want and we go to bat for them.” Doing so sometimes involves special problem-solving, tricky remodels, and refining design to be even more custom. Know the price and durability of what you’re looking for. Some tables wear quickly and others are heirloom quality that need refinishing through the years, both of which correspond to price. Have an idea for style. “For obvious reasons, the functionality of tables haven’t changed much in the past ten years,” says Wright. “But the style has. Right now, we’re seeing an aesthetic with added iron and glass, antique barnwood, live-edge tables, and other modern elements.” That doesn’t mean you have to go modern, but knowing your choices will help you find just the right fit. But first, remember to measure. When you think of appliances, the words “cold,” “hard,” and “utilitarian” may come to mind. 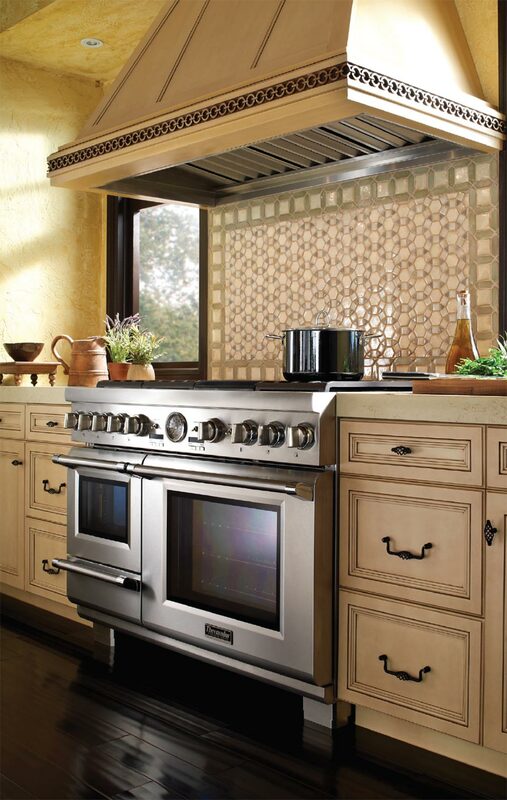 Finding the right installation for a space evokes equally concerning adjectives including “expensive,” “confusing,” and, most likely, “overwhelming.” Shopping for stoves, refrigerators, or dishwashers typically involves overstocked showrooms and conflicting online reviews. The process can be painful. Not with Ferguson Bath, Kitchen & Lighting Gallery. 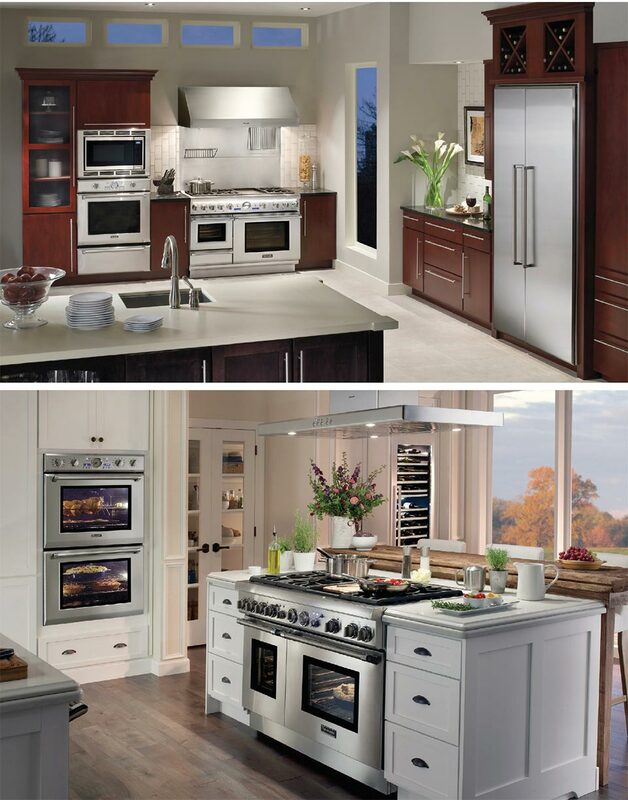 The national company has invested a great deal of time and effort in providing top-notch customer service and knowledgeable local salespeople to make appliance shopping more enjoyable, resulting in a sense of ease during the entire process. “We take a lot of pride in our associates and believe that they set us apart from our competition. Every hire in the company undergoes extensive training to understand what Ferguson does, how we do business, and how we create personal connections within each market,” says Montana area showroom manager Emily Krieger. 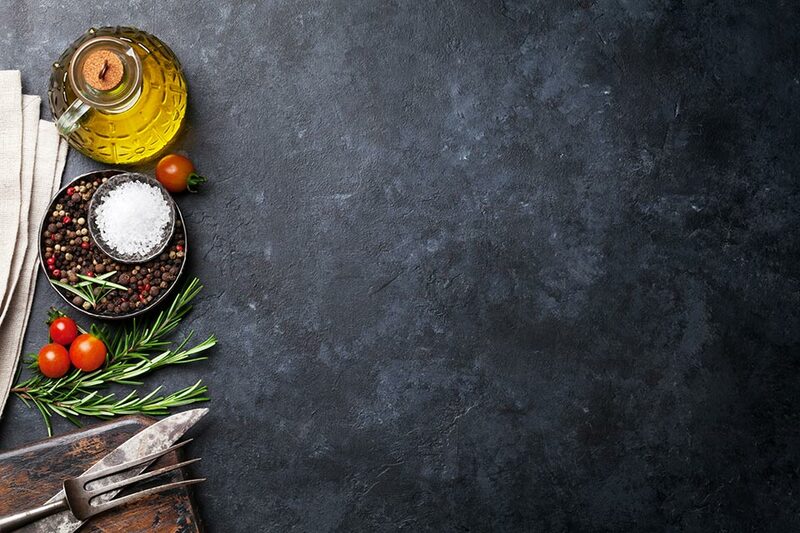 Sometimes a client will come in wanting to see an expansive range but his or her cooking needs might be more suited to a less complicated stovetop. Just one face-to-face conversation will help the team determine what kinds of cooking the kitchen will support, and which areas of the design they can best customize. Therein lies the value of the team: personal, real-time connection. Each of the Ferguson showrooms is spacious and filled with dozens of different brands in their inventory. Krieger says narrowing down the options is one of the greatest challenges for new clients. 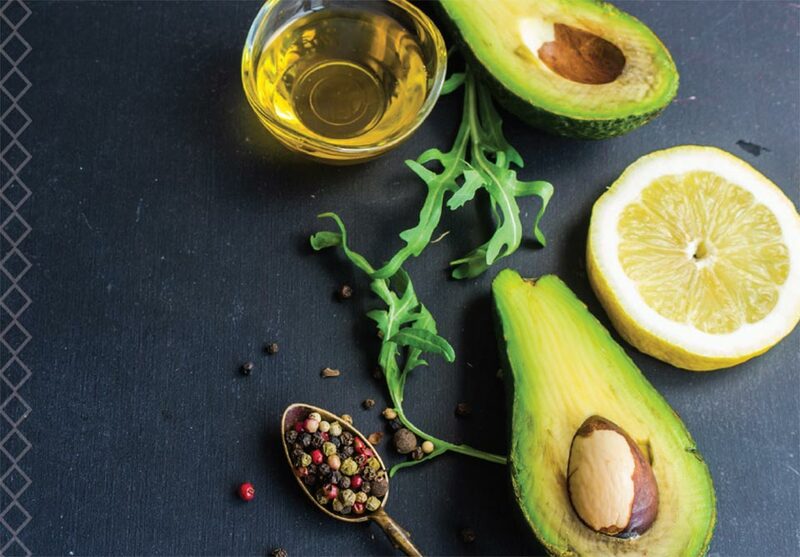 After gathering some ideas on taste, the Ferguson crew encourages clients to set up an appointment with a showroom consultant to pinpoint exactly which products will best suit their needs. “We like to have about two hours of uninterrupted time when we can focus on the customer’s selections. We will often re-visit the selections until the customer is confident with the purchase,” says Krieger. After that appointment, clients are presented with a portfolio as a reminder of all that was discussed as well as which selections might be the best fit for their projects. After years of success stories, the case has been made for the impact of Ferguson’s personal touch, making the process of selecting appliances seem not quite so cold.